What is PDF Link Editor? PDF Link Editor is a PDF hyperlink editing tool that does so much more than just edit PDF hyperlinks. This small and smart application makes editing multiple PDF hyperlinks with Acrobat a thing of the past by enabling users to edit, add, replace, remove and extract PDF links in batch mode. This speeds up each and every task involving PDF links, freeing up users’ time which they can use on other priorities. PDF Link Editor is built with an intuitive and elegant interface that is so easy to use even for novice users. With just a single click, users can replace Hundreds of PDF Hyperlinks, add or Insert Hundreds of hyperlinks to PDF, quickly clear or Extract All Hyperlinks, and more. It is compatible with all Adobe PDF editions but doesn’t require users to install any Adobe plugin to make it work. 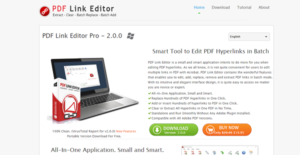 PDF Link Editor accelerates and simplifies the way you work with PDF hyperlinks. Gone are the days when you had to search and replace PDF links individually with basic PDF tools. It is such a cumbersome process that gobbles up a huge chunk of your time, resulting in poor efficiency and low productive output. With PDF Link Editor, you are able to replace hundreds of PDF Links by batch. This smart tool can search all PDF hyperlinks and list them accordingly and automatically when you add a PDF file. And with a single click, you can export all your new/changed PDF links instantly. Managing your PDF links and anchors becomes a breeze. Aside from editing PDF hyperlinks, PDF Link Editor lets you add or insert hyperlinks to your PDF files with ease and speed. With its Batch mode functionality, you can search and mark every anchor you want and PDF Link Editor will insert all the URLs you have inputted. Adding or inserting hyperlinks to PDF files need not be boring and monotonous. And when you have clear or extract one or all hyperlinks from your PDF files, PDF Link Editor takes care of that. Same with adding and inserting PDF links, PDF Link Editor’s powerful engine can search for the links you have in your storage and clear them out or export them to a new folder. The best part is that PDF Link Editor is a stand-alone product and doesn’t need Adobe PDF to be installed on your system in order for it to work. What Problems Will PDF Link Editor Solve? 1) PDF Link Editor can Clear all hyperlinks in your PDF files by batch. 2) PDF Link Editor lets you add more than 100 hyperlinks to PDF. 3) PDF Link Editor allows you to replace more than 100 hyperlinks simultaneously and automatically. If you are considering PDF Link Editor it could also be sensible to analyze other subcategories of Best Business Intelligence Software gathered in our database of SaaS software reviews. Each enterprise has its own characteristics, and can require a particular type of Business Intelligence Software solution that will be designed for their company size, type of clients and staff and even specific industry they deal with. You should not count on locating an ideal app that will be suitable for every business no matter what their background is. It may be a good idea to read a few PDF Link Editor reviews first and even then you should pay attention to what the solution is intended to do for your business and your workers. Do you require a simple and intuitive app with only basic functions? Will you really make use of the complex functionalities required by pros and large enterprises? Are there any particular features that are especially practical for the industry you operate in? If you ask yourself these questions it is going to be much easier to find a reliable solution that will fit your budget. How Much Does PDF Link Editor Cost? PDF Link Editor offers an enterprise pricing license package. Contact them for more product details. We realize that when you make a decision to buy Business Intelligence Software it’s important not only to see how experts evaluate it in their reviews, but also to find out if the real people and companies that buy it are actually satisfied with the product. That’s why we’ve created our behavior-based Customer Satisfaction Algorithm™ that gathers customer reviews, comments and PDF Link Editor reviews across a wide range of social media sites. The data is then presented in an easy to digest form showing how many people had positive and negative experience with PDF Link Editor. With that information at hand you should be equipped to make an informed buying decision that you won’t regret. What are PDF Link Editor pricing details? What integrations are available for PDF Link Editor? If you need more information about PDF Link Editor or you simply have a question let us know what you need and we’ll forward your request directly to the vendor.